To Fernplant on the "Ships starting with F" page. All pictures were kindly received from Historical Department, MAN B&W Diesel, Copenhagen. Their representative says that their museum (external link) has models of some ships. Here are 2 more pictures, Pic 1, and Pic 2. (Size and quality have been reduced to save space. Several more, very similar pics were also received). Built by Burmeister & Wains Maskin- og Skipsbyggeri, Copenhagen in 1939. Helene Karoline J. Fischer Dale served as a radio operator on this ship after the war. She had previously served as stewardess on Bayard from March-1940 till Dec. that year, and on the same ship from Febr.-1941 till March-1942, before joining Laurits Swenson in the same capacity in May-1942, till July-1942. The following month she started school at Little Norway, Toronto to become a radio operator, and fresh out of school she joined Fred. Olsen's Baalbek as 2nd radio operator in June-1943 (till Sept.-1943), before signing on Alf Lindeberg in Oct.-1943 where she stayed till Dec.-1945. Just 2 days after signing off Alf Lindeberg she joined M/S Fernplant, this time as 1st radio operator, remaining with this ship until March-1946. She was later awarded Krigsmedaljen and Haakon VII Frihetsmedalje - see my Norwegian War Medals page. Many women sailed with the Norwegian fleet during the war; mostly as stewardesses or saloon girls. Norwegian ships also had several female Canadian radio operators; a list of their names can be found at the end of my page about Mosdale. (My mother was also a radio operator, though not during the war. Her ships can be found at Åse's Ships). The majority of the information on Helene Fischer Dale was received from Olive Roeckner, who herself served as radio operator on Norwegian ships (she in turn received the information from Berit Pittman, Canada). A book has been written about her experiences - see my text under Narvik. Sept. 6 New York City Gitmo Sept. 12 NG 303 For Suez. May 2 New York City   UGS 90 Dispersed May 18. As can be seen, only a few of her voyages are mentioned here. For information on voyages made in between those noted below, please see the documents received from the National Archives of Norway and A. Hague's Voyage Record above. 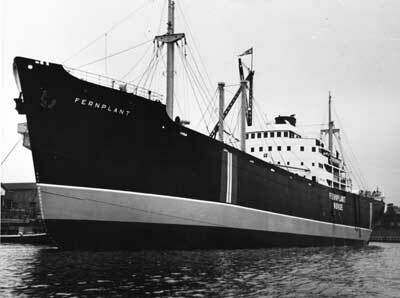 According to Page 1 of the archive documents, Fernplant sailed from Shanghai on Apr. 9-1940, the day war broke out in Norway. She arrived Manila on Apr. 12. Her 1941 voyages also start on this document and continue on Page 2, which also has a few 1942 voyages. 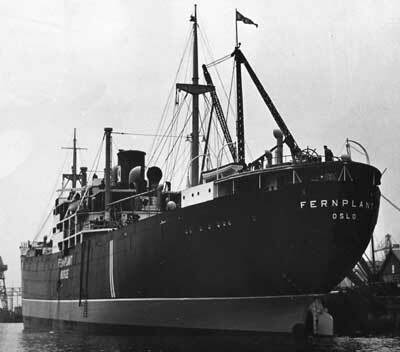 "Nortraships flåte" states that Fernplant was shelled on the night leading up to Febr. 25-1942, when off Aruba (from the archive document, we learn that she was on her way from Cristobal to Trinidad on that date). Her log states that the incident took place at 00:16 while she was proceeding on a zig-zag course. The fire came from an unknown surfaced attacker on the starboard quarters. Under the leadership of 3rd Mate Morgan Nilsen Fernplant returned the fire, but missed. Maneuvers were performed to get the enemy behind her while full speed was given, then Fernplant's 4" aft gun was fired. After Fernplant's 4th shot, the attacker stopped firing, then at 00:20, as the intruder took off, 2 more shots were fired from Fernplant. One of the shells from the unknown attacker had exploded 5-10 meters behind Fernplant, with the shrapnel causing some damages to the ship. Her subsequent voyages are shown on Page 2 - see also Page 3, which has the rest of her 1942 voyages as well as some 1943 voyages - convoy information for some of them can be found in the Voyage Record above. 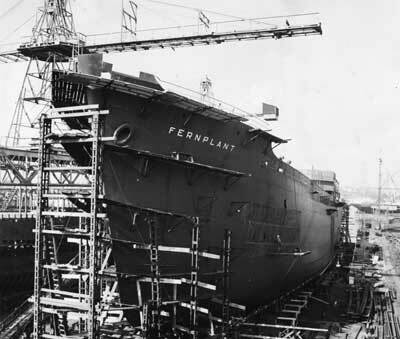 Claims in some sources that Fernplant was sunk by Limpet mines are incorrect. Luigi Ferraro did attach Limpets to the ship at Alexandretta on Aug. 2-1943, but she arrived Haifa on Aug. 6, quite unaware of the danger she had been in. The explosives were found during an underwater inspection by the British naval authorities, probably initiated because another unexploded Limpet had recently been found on another ship. Later that month, she made a voyage from Alexandria to Gibraltar with Convoy MKS 23 (scroll down to the second table on that page). She had left Alexandria on Aug. 25 and arrived Gibraltar Sept. 4. The rest of her 1943 voyages are shown on Page 4, which also has her 1944 voyages - again, A. Hague's Voyage Record above has convoy information for some of them. 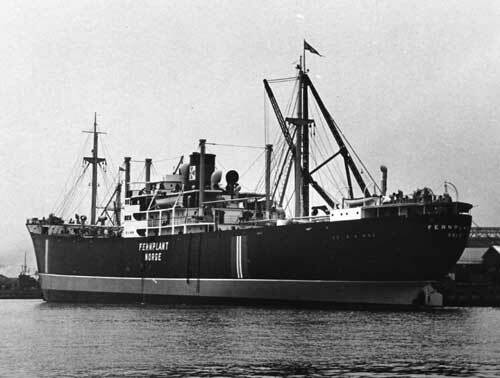 Skipping now to the summer of 1944, when I have her among the ships in Convoy GUS 47, which left Port Said on July 24-1944; Fernplant was on a voyage from Mersin (July 22); she arrived Baltimore on Aug. 18. The Norwegian Tricolor, Polartank, Kong Sverre and Lidvard also joined this convoy from Port Said, while Topdalsfjord later joined from Bizerta. Gard is also mentioned, voyage from Gibraltar to U.S.A. for major engine repairs. Page 4 also lists some 1945 voyages, while the rest are shown on Page 5 (to Apr.-1946), with convoy details in A. Hague's record above. Sold in 1963 to Societe Monegasque de Transports Maritimes, Monaco, and renamed Saint Charles. 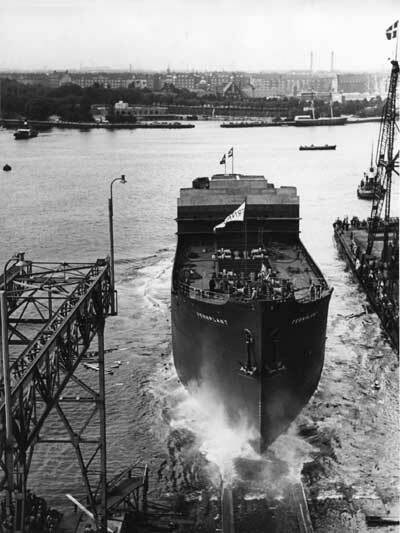 Sold in 1967 to Thalassa Shipping Corp, Panama, and renamed Thalassa. Sold in 1970 to Astro Atlanica Armadora S.A., Panama, renamed Thalassa B. Broken up at Mangalore in Nov.-1970. Alexandretta - A Section of the Italian "Regia Marina". Fernplant is mentioned. Back to Fernplant on the "Ships starting with F" page.